When he was handed a book containing patterns of the Scandinavian weaving structure called Krokgragd written in Swedish, Lou Cherichetti was fascinated by the breathe of color and designs. At that time he had been weaving rugs and was interested in expanding the experience. Not expected was the challenge of having the book written in Swedish. 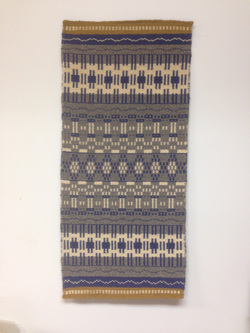 Using conventional weaving patterns at the time, Lou was fascinated by the versatility of the Krokbragd weaving system and the ability to develop interesting pattern and color combinations. The rugs exhibited are Dobbel Krokbragd which adds thickness and softness to the rug by creating an overshot on the back side of the rug. Feel the rug to appreciate the texture and softness of the underlying layers. The rugs are 100% wool and can be used as floor rugs or wall hangings. An active and prolific creator of functional and beautiful pottery for more than 35 years, Granby-based potter Avis Cherichetti has found a new, refreshing energy while producing nearly 100 innovative clay works for her first one-person show at Lost Acres Vineyard. This show demands her creations come out of cupboards, off their pedestals and onto the walls. It has required her to think in new dimensions: creating both decorative and functional ceramic pieces designed to be displayed and cherished every day. Mirrors, clocks, decorative plates: all are original, singular works that reflect her continual experimentation and desire to expand the boundaries of her chosen medium. 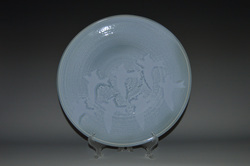 Avis's current work expresses repetitive motifs—which may be printed, carved or executed in glazes—on pieces of varying colors finished using an array of firing techniques. Some ceramic pieces are finished in low-temperature saggar or raku kilns; others are fired at high temperatures in soda, reduction or oxidation kilns. Some of the kilns are powered by electricity, while others may be fueled by gas or wood. An endless array of surface patinas can be achieved depending upon the final firing process selected. As she meets the demands of working with clay, taking into account that pieces are 15 percent smaller after the final firing than they were when she started, Avis is reminded all artists must contend with natural limitations inherent in "the materials used, the equipment available and the skill of the artist." Avis embraces this element of mystery. She is inspired by all she sees, both natural and human-designed, but her greatest inspiration is the clay itself. During the process of creating, she is always considering what to try next, as the possibilities are endless. Her pottery has earned accolades and awards including an Individual Artist Fellowship from the Greater Hartford Arts Council. Her work has also graced the pages of Yankee magazine and been represented by fine galleries and selected for the Slater Memorial Museum's permanent collection. One of her clay pots even survived a trek to the top of Mount Everest.